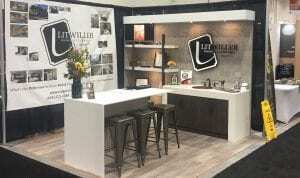 Back from the Calgary Renovation Show, we’d first like to thank everyone who took the time to visit us at booth #359. Prior to the renovation show, our very own David Litwiller was interviewed by Global TV Calgary News. During the interview he discussed two topics near and dear to his heart; the importance of consumers gathering and checking references and the importance of getting agreements in writing. Both steps are imperative for a positive renovation or construction experience. Our booth at the show garnered many positive comments and feedback from visitors on both design and presentation. Designed and built by Jim Wardell of Made to Design Woodcraft, this positivity was well received, and we look forward to many years of working closely with Jim and Charlene on projects throughout the Calgary area. During the Calgary Renovation Show we had the pleasure of meeting with plenty of positive and sincere people searching for the right contractor for their home improvement projects. We met with folks looking for all types of projects from small jobs like bathroom renovations, to full scale home construction and everything in between. As is typical of Litwiller, we rarely pass on any project referred to us or being contemplated by a past customer. No matter the size of the project, we’re here to help as best we can. The team at Litwiller Renovations & Custom Homes are committed to delivering a dynamic and worry-free home improvement experience to all of our clients. So as part of this commitment, we’ve been keeping busy since the renovation show staying in touch with potential clients and following up with individuals who’ve shown an interest in working with us. In conclusion, we’d like to once again thank all those who took the time to visit our booth at the Calgary Renovation Show and discussed their future projects. For those of you who weren’t able to make it, don’t forget to visit us at booth #382 at the upcoming Calgary Home and Garden Show. The show will be held at the BMO Centre Stampede Park from the 1st to the 4th of March. Stop by and meet our wonderful team of professionals and in particular meet Paul Monk, the man slated to become the new face of Litwiller Renovations and Custom Homes Ltd.